JACKSONVILLE, N.C. — The main road that connects a strip of tattoo parlors, pawn shops and restaurants to Camp Lejeune is still lined with broken trees bent by Hurricane Florence’s winds. Inside the gates, a new threat has arisen for the sprawling Marine Corps base as it contends with billions of dollars in hurricane damage and lingering effects of contaminated water: President Trump’s border wall. On Tuesday, the House will try to override the first veto of Mr. Trump’s presidency and rescue Congress’s bipartisan bid to block the president’s national emergency declaration, which Mr. Trump wants to use to siphon military funds from projects like Camp Lejeune’s reconstruction to build a wall on the Mexican border. Last month, Democrats appealed to Republicans — with only limited success — to vote down the president’s emergency on the lofty grounds of constitutional prerogative and Congress’s control of federal spending. This time, on the veto override, their appeal is more parochial: Look where the wall money will come from. The expansive list of Defense Department projects targeted for possible cuts — $12.9 billion in all — spans nearly all 50 states and more than two dozen countries where troops are stationed. Fire station repairs, new schools and training complexes are all slated for potential funding delays to fulfill Mr. Trump’s intent to take up to $3.6 billion in military construction funds for the wall. So are plans for Camp Lejeune’s new water treatment facility. “What may seem small is large to others,” said Monique Gibbs, 39, a Jacksonville, N.C., native who works with survivors of trauma and abuse. The Defense Department is rushing to sign contracts on several of those projects, hoping that will protect them. But some projects would be hit if the emergency decree survives its congressional rebuke and court challenges, and delays could be consequential for service members and their families. National Guard officials are scrambling to award money to build a $9 million fire rescue station in Peoria, Ill., before it is lost to the border and locals are left with an outdated fire station — built in 1992 and incapable of providing 24-hour support. At Fort Campbell, Ky., home of the historic 101st Airborne Division, base housing and maintenance facilities are throwbacks to the 1950s. The structures have slowly degraded under the rapid deployment tempo of the wars since the Sept. 11, 2001, attacks, according to congressional aides who recently toured the facility. And without congressional intervention, construction on a $63 million middle school will be delayed and base officials will likely repurpose an aging high school in the interim. 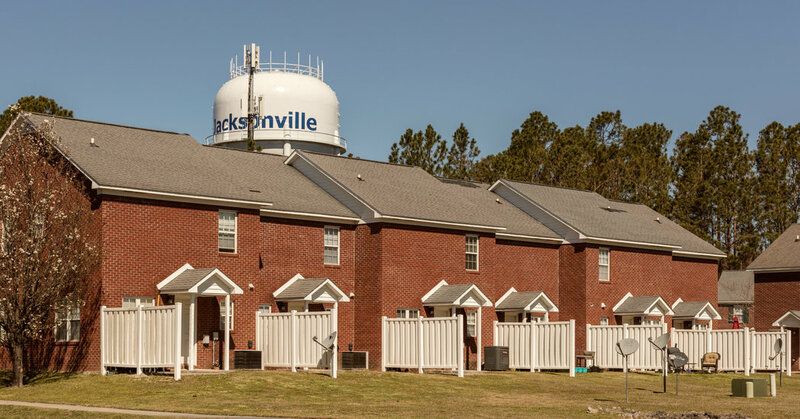 In Jacksonville, there is discomfort among residents that money for Camp Lejeune’s projects could be delayed for a wall more than a thousand miles away. John Henley, a defense contractor here, doubted the “financial feasibility” of Mr. Trump’s signature campaign promise, but he also was resigned to a local hit. Efforts to turn the list into political ammunition against Republicans are particularly pointed in North Carolina, where Senator Thom Tillis, a first-term Republican, is running for re-election next year. Mr. Tillis publicly outlined his intent to vote against Mr. Trump’s national emergency declaration last month in a Washington Post opinion piece last month that dwelt on his constitutional responsibilities. Then, just before the vote last week, he changed his mind and voted with the president. Already, the state Democratic Party has blasted out emails detailing which North Carolina projects were on the list — including the Camp Lejeune water treatment facility — and condemning Mr. Tillis for putting “his political career ahead of the well-being” of local military families. That fund-raising email sparked more than double the average amount in donations, according to a person familiar with the results. Republican strategists and several conservative voters said his flip-flop suited them fine. Potentially losing money for military projects, he acknowledged, “is not the best” for the state. But he said it was something he and other conservative voters could accept for Mr. Trump and his wall. Republican lawmakers who voted against the national emergency declaration found that sentiment prevalent when they returned to their districts. Senator Roy Blunt, Republican of Missouri, was disinvited from a Republican dinner after his vote against the emergency declaration, the Kansas City Star reported. And at a town hall-style meeting in Spokane, Wash., on Monday, Representative Cathy McMorris Rodgers told about 20 constituents that her vote for the resolution of disapproval — “a difficult vote for me,” she repeated — was a vote against a president trying to secure taxpayer funds without congressional approval, not against a border wall. Some applauded her resolve, but others were unconvinced of her support for Mr. Trump’s border security vision.